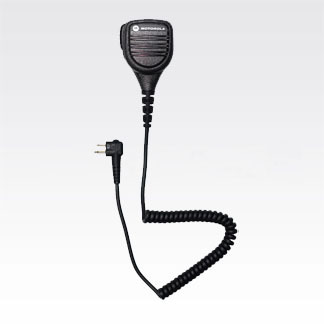 These Remote Speaker Microphones include a six foot coiled cord assembly, swivel clip and quick disconnect latch. The windporting feature dramatically lessens background noise from high winds and other severe weather conditions. The IP57 submersible model was tested at one meter for 30 minutes. Intrinsically Safe when used with the PR400.